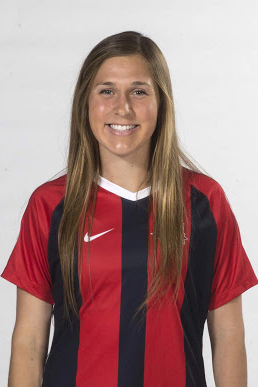 A regular for U.S. youth national teams since Under-14’s… Current player for U.S. U-23 National Team… Has made appearances for U.S. U-20 National Team, U.S. U-19 National Team, and started for U-18’s at the 10 Nations Tournament in Spain (March 2014)… Attended U.S. U-20 camps in 2016 and traveled with the team for the La Manga tournament in Spain. Started in 91 of 92 games she appeared in over a four-year career at Stanford… Scored 31 goals, including 15 game winners… contributed 23 assists. Senior Year: Started all 24 games and captained the team for Stanford… Set her career high in goals (10), assists (10), and points (30)… Named to All-America first team, All-Pac-12 first team, United Coaches All-Pacific Region first team, United Soccer Coaches Academic All-America first team… Named the Pac-12 Midfielder of the Year, MAC Hermann Trophy Finalist… Ranked 3rd in Pac-12 play for goals (3), and 5th for points (17). Junior Year: Started all 25 games in Stanford’s Championship winning year… tallied 9 goals and 10 assists, 28 total points, led the team with six game-winning goals… Named to All-Pac 12 second team, College Cup All-Tournament Team. Freshman Year: Started all 23 games… Tallied 5 goals, 1 assist, and 11 points… Named to Pac-12 All-Freshman team… Was Pac-12 Offensive Player of the Week (Nov. 3)… Made collegiate debut Aug. 21 at Hawai’i… Scored first collegiate goal (a game-winner) against No. 9 BYU (Sept. 7).